Right now, the simple story is still pretty simple. I am out playing the street every weekend. 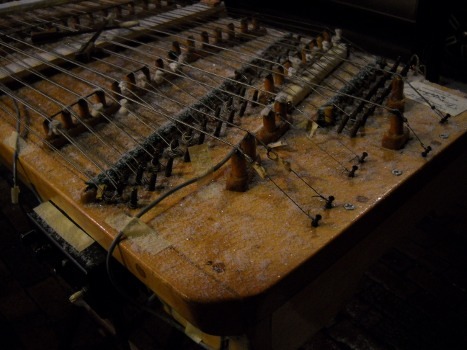 Occasionally, it has been amazingly mild, but mostly it is brutally cold, and I play with numb hands and stiff muscles. It is amazing that the music can still be great, despite my seriously compromised ability, and that I still really enjoy playing, despite the pain. I've lived through a lot of tough times, harsh conditions, and learned to laugh at it, when I can, but it still hurts. I live with it, as I always have, but what bothers me is that it is unnecessary, forced upon me, and just stupid. I do what I have to do, but normally I'd be in Florida, following the festivals and the tourists, spending the winter season with the boat and the sea. I live a smart and practical life, and playing the street in winter is pretty ridiculous, and I know it. But I have no choice, so I do what I have to, get it done, making beautiful music and great moments, no matter how hard it is. I struggle to make some progress. Mostly I'm forced to just survive. The simple truth is that this is a terribly hard time in my life, painful and frustrating, depressing and discouraging, a "winter of discontent", a winter of suffering. I knew this was coming, knew the cost of being forced to spend the winter here, and now I am living through it. I am grateful that I did well up through the holidays, so lucky that I got some breaks from the weather at first, but now winter has closed down hard, with cold and empty streets, and brutally hard conditions to play in. I struggle on, but all I am able to do is tread water, and I'm slowly slipping backwards economically, but only slowly. That is a huge accomplishment in the circumstances, but that is small satisfaction, and it is coming at a high price. I work all day, every day, and often late into the night, but it's all in response to the demands of being here, or trying to just keep up and maybe catch up to where I was, last Spring or even before. But true progress is not happening. Though I am still hoping that I'll eventually make some limited progress. In these circumstances, when I can't do anything that requires any commitment, don't know if I'm staying or leaving, or when, anything I do to set up, to make progress, is just more to pack up again to move, any unpacking is a risk, When I may have to pack up again any day. I wonder if I should working on making progress, or working on getting ready to leave, keep packing up. I wonder if I should assume I'll be able to swing the house and focus on getting things done, but I am too pragmatic to make plans on big assumptions. So I focus on getting by till the situation is decided, focus on this winter as a temporary delay, and try not to let it set me back. Though it is difficult to lose this time, after having my life put on hold for a couple years now, to lose more time. I work all day and into the night every day, there is always work to do, but it is focused on the priorities of survival and dealing with circumstances, instead of real progress. I’m doing what I have to, working hard and getting it done, getting by, surviving despite the unfortunate circumstances, but it is still frustrating and discouraging. I got the woodstove installed right after New Years. It really makes life a lot better, as I am able to actually heat the house, somewhat. It is way better than the fireplace, and much more efficient, but I still have to spend a lot of time finding, gathering, and dealing with firewood. But it saves a lot of money by keeping the furnace from burning gas, burning money, which is a serious problem of being here now. So I got firewood split and stacked in the jury-rigged shed, or inside the house, before the first wave snow came. It feels good. The biggest frustration is that I let opportunities to really score wood when I got here slip by, because I couldn't justify the time when there was no way knowing how long I'd be here, and I had so many other things to do so I had to justify ever minute of time spent on anything. So now I have to scrounge for wood constantly, just getting by week by week. But I do, and the woodstove feels great as temperatures plummet. 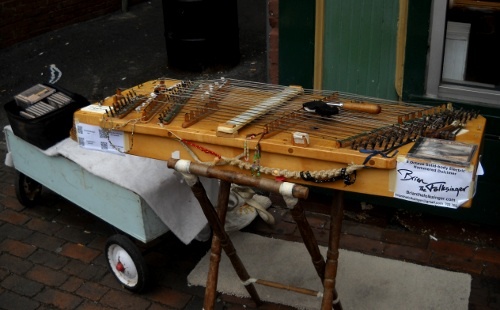 As for dealing with circumstances, I had jury-rigged the dulcimer with one pickup to keep on playing, depending on another stop-gap solution. Good enough is good enough, and it worked, but it is not a real solution. Still, it got me through, kept me moving, skating on thin ice. 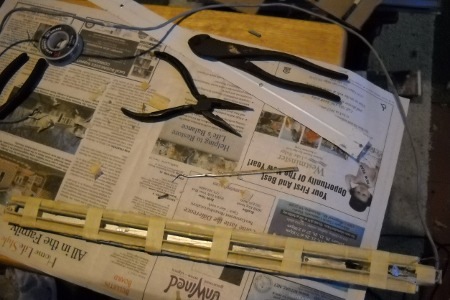 After the holiday push was over, and the woodstove was going, I was able to use a couple coils I had wound last Spring to make two replacement pickups, and get the dulcimer working the way it should again. 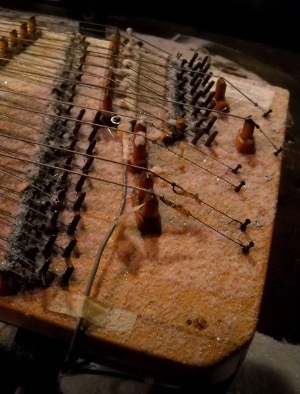 I had to go through the whole process, soaking them in wax melted over the woodstove, adding magnets, which I was again, lucky to find, and connecting the cable to the coil wires before sealing the finished pickup in it's case. I experimented with the short treble pickup, using a single line of bar magnets running up the center instead of two lines running up each side of the coil. I now have three different pickup types in the working set, the remaining V.1 cast in epoxy and unshielded, and the two new ones, potted in wax, one shielded and one not, one with dual magnets and one with a single. Then I had to totally rebuild the control box I had diassembled in an initial and misguided attempt to find the problem when I was way too frustrated, rushed, and too tired to think straight. But I got it done, and mounted them on the dulci just in time to go play. Though again, this is not true progress. I am only back to where I was, with one working set, and no replacements, and no time since to work on making a second set. It was still a couple weeks before I had time to actually drill some holes and screw the short treble pickup down in place. It was great to have the dulcimer sounding the way it should again, even if I had to jam some felt in to hold the short pickup down for a while. That is the priority. But I am hoping that now that I have found everything and have been through the process, I may be able to make a second set or more, till I use up the coils I have wound. 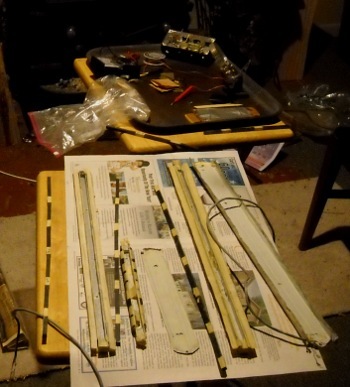 I even think of ways to rebuild the winder, somehow, and wind more coils. 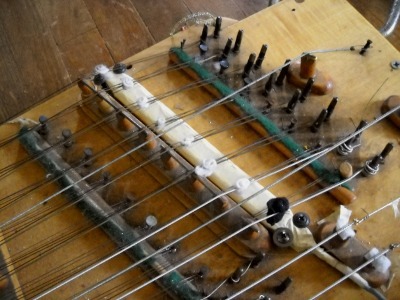 As I correspond with people interested in building electric dulcimers, I mention the fact that all they really need is a set of pickups to convert a standard acoustic dulcimer to an electric, though not the same range or layout as mine, it would work for a start, and actually, making the pickups is as much or more of a problem than building the dulcimer, and a used acoustic isn’t very hard to find. 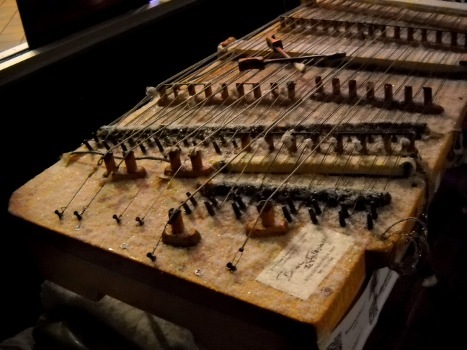 Getting me to make them a set of pickups might definitely be quicker than getting me to build an entire electric hammered dulcimer for them, and they can get started. 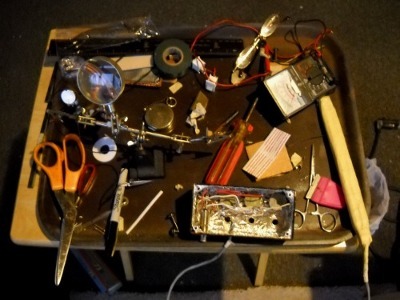 Everything they learn, and probably the pickups as well, can be transferred to a solid body electric when I start building them for people. I am getting by. I baked bread for the first time since I got back. I make big pots of rice and vegetables, with dried greens, herbs from the summer before last which I dried in the late Fall of 2011. I am managing to make it through partly because I have a stash of flour and rice, and other supplies, from last year. Occasionally I buy cheese or eggs. This has always been part of the gypsy strategy, buying basic staples in bulk when times are good, so I can make it through lean times. It has served me well, now. I'll have to spend more money on buying bulk sometime, I'll make it last as long as I can. I am very good at getting by on very little money, and I am pushing it to the limit these days, and getting by. It may seem silly, but back in December I bought a bag of birdseed as an xmass present to myself, for working so hard and doing so well by sticking it out. 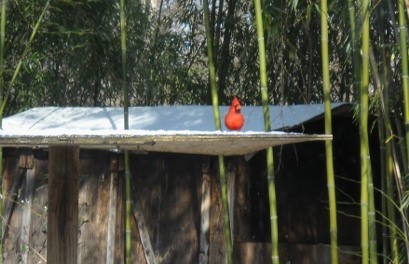 I love to see the birds, and I keep fresh unfrozen water out for them, and a little food, and they roost every night in the shelter I have developed here, both naturally, with bamboo stands and understory shrubs, and by gathering thrown-out christmass trees to make a brush pile for them. The smell of the spruce every time I walk by on my way to the wood pile is a great pleasure, too. Tonight, as I write, it is 18 degrees outside and snowing. Tomorrow I will pack my gear and head out to play the street, because I have to. I have no other options, not in the short run. I need to do whatever I can, and I do whatever I have to, to keep paying the bills, and even if I can't get ahead, at least I'm not fall behind as fast. When I got back from playing the street last Sunday it was 25 degrees out. They are calling for a high of 32 tomorrow. Well, I can take some pictures of me playing in the snow. Last week I finally got my few xmass presents sent out so I can justify openning those I received. Like the tree, that energy is at a low ebb. I was just too busy during and right after the holidays to even think of it. But I just planted the xmass tree out in the yard near last years in a little grove of juniper I've started, more shelter for the birds, if I keep the place. 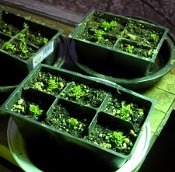 I make cuttings from the couple ragged basil plants I brought in from the garden, a sign of hope for the future, starting new plants in mid-winter, though I don't know where I packed the rooting powder, so they may not make it. I can still try, just like planting the tree. I hope they take. I hope that I will have a reason for them. I hope a lot in these uncertain times that things will work out eventually, one way or another, and this hard winter will end in something better. Today I sit by the woodstove with chill hands, writing this. Earlier I did some yard work outside, dismantling a collapsed arbor before the snow today. My hands were numb when I came in again. Though Alaska has prepared me for this, to work in the cold. It is amazing to me that your hands still work when they are stiff and my fingertips are numb, but it still hurts, the cold that burns. Through this long hard winter, I keep reading books from the library. Novels pass hard nights when I can't sleep from tension and tiredness, distract me when my emotions start to build into a storm. All stories are a vehicle for some perspective, some truth and wisdom. I have been having this ongoing conversation about writing, so I am also studing the writing itself, taking notes as I always do, on both the style and the content. I read my one magazine, "Scientific American." I focus mostly on non-fiction, though, these days, to expand my knowledge and skills, and to keep up with the public discourse, get the real facts behind current and recent events we still live with, in a time when the public discourse is full of misinformation and distortions, deceptions and distractions, and simple misquided assumptions and perceptions. I am limited to the sometimes great but limited coverage by talk Public Radio, which is limited by time, and money, the need for repetition, and is still diluted with info-tainment and human interest stories and programing. Even the best programing is often responding more to the public interest, even when misguided, than to the realities of the issues. But that is one of the problems with the public debate, it is full of arguements and discussions over basically flawed premises and perceptions, unfortunately. So it goes. But they still have great shows, great interviews, I am just way better informed than most of their audience they are foused on, quite rightly. One thing I like about being in DC makes national and international news and issues a big part of the local news, which is what I want to hear about. Still, it is all I have, trapped here in a house that is all but shut down, and I am grateful to have it. But in the end, I am often just frustrated at being unable to participate in the public debate, write my representatives, do something. But that is an old issue in my life, and another story. I know that right now I am trapped in the realities of just struggling to survive a hard winter, and am grateful I can even tread water, considering the alternative, but it is another source of frustration, in a already frustrating winter. I finally took the epoxy I brought in weeks ago, before the freeze, and repaired the big hole I made in the guitar last summer up in Alaska, north of the Arctic circle, playing for people around a campfire. That, too, is another story, one I haven’t had time to write. 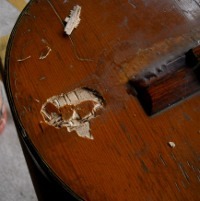 It is just the latest hole, the latest repair, for a quitar with a long story behind it. I'll hand people the guitar and tell them to really look at it. If that guitar could talk, it would tell stories, too, but it still sings, and rings. I have yet to find it’s match, and I wish I could so I’d have a second. But I have never found one with the same warmth and depth of tone. I am lucky to have it, even if it has had a hard time of it, I think it has enjoyed the journey. Like me, it has been places and done things, and yes, it shows the scars, just like me. My guitar is a part of me, of my life, so finally reapiring it is a positive action, psycologically, which is good, and I choose it intentionally as a simple task to get done one day. But it isn't really progress, again, just trying to get back to where I was when I left. Though repairing the damage a hard life brings is a normal part of the life, the regular routine after completing a trip, before the next, so it is part of moving forward, positive, even if it isn’t progress. I did a major repair just before I left last Spring. And I’m playing the guitar again, which is always good. 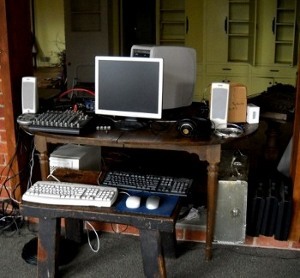 I had also unpacked the studio computers from storage weeks ago, before the first rain and snow. Last week I set them up, but it is not good. 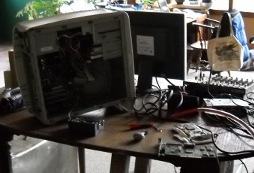 It is a network of two old computers, and one is broken now, the video chip has gone out, and it has no AGP slot for a card. It is a linux box, used for NAS and second stage processing and secure internet access orignally, and maybe I can replace it with this linux laptop, but setting up a LAN has always been a difficult task. The original more important main studio computer is an old win98 box. It boots, but as I start to try and use it, premiere crashes instead. Not good. Everything worked before I was forced to take it apart and store it on the trailer while I was gone. Now it is not working, and will take a lot of work possibly to make it work, if I can at all, another setback instead of progress. Yes, it is a frustrating and discouraging time. The thin ice does not hold, and the fact is I am tryng to make progress using old gear, from vehicles to computers, that I planned to upgrade a couple years ago, but circumstances got in the way, once again. So I’ll see what I can do to make it work, if I can, once again. I wonder if I should focus on finding indoor venues, but they may not pay as well as the street, even in winter, though they won't be so painful. But this is a business, and the reality is that there is little chance of getting a gig immediately, only possibly booking something far ahead, and I don't know if I will be here long enough to justify that both practically and ethically. In my good moments, I want to see my time stuck here as an opportunity to do something progressive, even if three months have passed and there seems little hope of that. I could build more pickups. I could try to buy wood to build dulcimers, get that small, but critical step done. Though it will mean spending money I don't have, and having more to move if and when I leave. It could be harder once I go. I still have the other half of the plank I bought twenty years ago to build the first, and I could try to build a second so I have have a spare, as a backup, as some security on thin ice. I tell another story these days, as the stories arise in the telling, in the the thread of the street, like a certain bead that appears again and again. 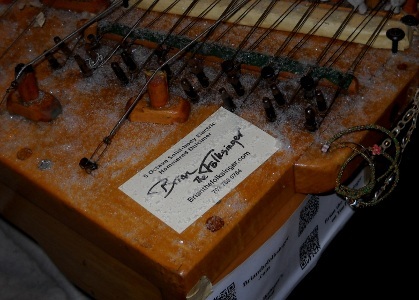 I talk of "giving the dulcimer a life of it's own". Because "what you pass on, lives on,and the rest dies with you." 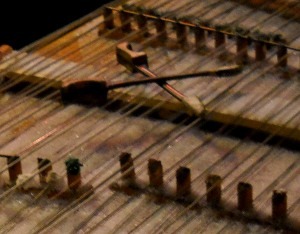 Because there is so much potential in the dulcimer that I can never realize,and I need to pass the dulci on to others who can take it places I will never go. 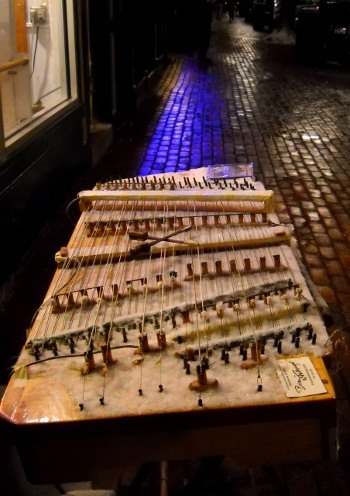 I say "though I can play a wicked Samba, I will never play the dulci the way someone who grew up in Rio would, or someone who grew up in China, or Cairo, or India, or just a different artist in America. "Paint is just paint", but every painter is different, unique, in what they do with it. 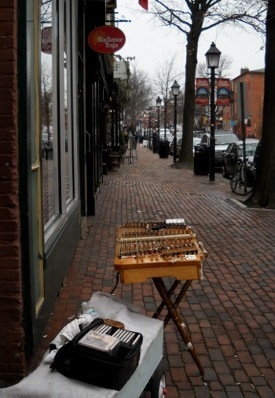 So too, with the dulcimer. If I build more and pass them on. 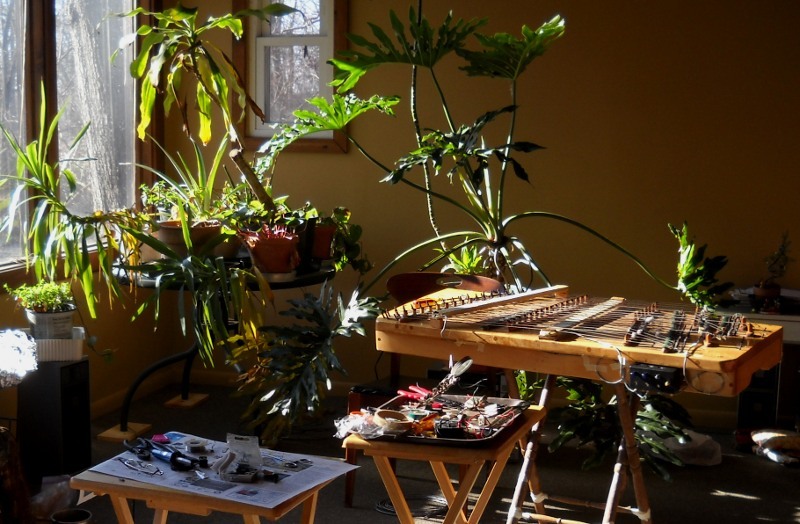 An interesting development is that I have been answering more emails from people asking questions about their dulcimer building or playing, being a resource for them, which is great. 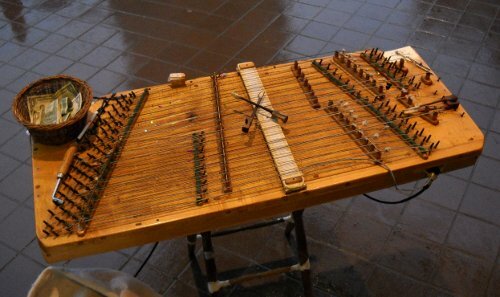 I encourage people to try building their own dulcimers, and trying to design and build electric dulcimers, trying their own designs, as mine is simply one possibility, just like electric guitar makers. 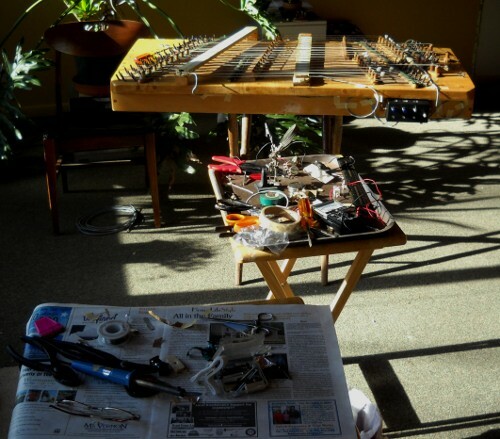 Though I am trying to build more electric dulcimers so I can pass them on to others, progress is nil at this point, though one of my greatest priorities is to "give the electric dulcimer a life of it's own". "What we pass on lives on and the rest dies with us." But all this "doing more" is still a work in progress, and there is so much I would like to do, but I just can't. I struggle with how much time to devote to this and how much to that, and still struggle just to survive. The hardest thing it seems is to decide on a course of action. Look for venues, which could really be useless, and again, only allow me to keep treading water, not progress. I can focus on progress, rather than playing more comfortable venues, accept playing the street all winter as the price. I could try to work on "doing more", rather than just getting another low-paying gig in a small venue, try to step up somehow. I could try a lot of things. The big question is priorities. What I need first, if anything, to be ready before I start making contacts, try to pursue greater opportunities. Do I need to focus on new and better recordings than the limited and imperfect examples I have now. I can't record, but if I can get the studio computers to work, I could try producing video, capitalize on the fact that last Spring I did invest in repairing the videocamera. And I have little if anything to invest right now, at least untill the house is settled. Since money is really is a problem in the way of "doing more", especially if I get the house, I think of refocusing on setting up a project on Kickstarter, something I had planned to do when I got back from Alaska in 2010, before I got caught up in caring for mom. It is often hard to explain, and for me to remember, how close to the red line I live, and though I have always managed, and lived well. I feel comfortable, usually. Still, it is really limited where money is concerned, and anything that does require it makes it obvious. I don't notice usually because my life has been focused intentionally on a path that doesn’t require a lot of money, on doing things that don't cost money. I scrounge and make do and am very creative, but the limits are still there. The simple truth is when weeks ago I sat in the car to chose how to divide my remaining money between gas and groceries. Every week, I deposit most all the money I make on the street to cover bills, to keep my cash reserves from free-falling, money I will need if I get the house. The next week, I deposited everything, and got through without spending anything on gas or groceries. The third week I again put $15 in the gas tank, enough to play another weekend, maybe two, and go spend the rest on groceries, carefully. I spend $10 on cabbage, carrots, onions, bananas, and oats. I have a dollar left in my wallet. This last week my budget for gas and groceries was $20. I skipped gas and spent $15 on groceries, try and make it through another weekend on the gas I put in last week. My visits to the library to access the internet are curtailed to once every other week, and email starts to stack up. So it goes. The simple story remains that as I try to finish this entry up, it snowed last night, and the wind is roaring through the trees. It will be in the low 20s tonight. Tommorrow the high is expected to be 35 degrees, and I have to go play the street. Last night's snow should melt away, though it might even rain, or maybe more snow over the weekend. 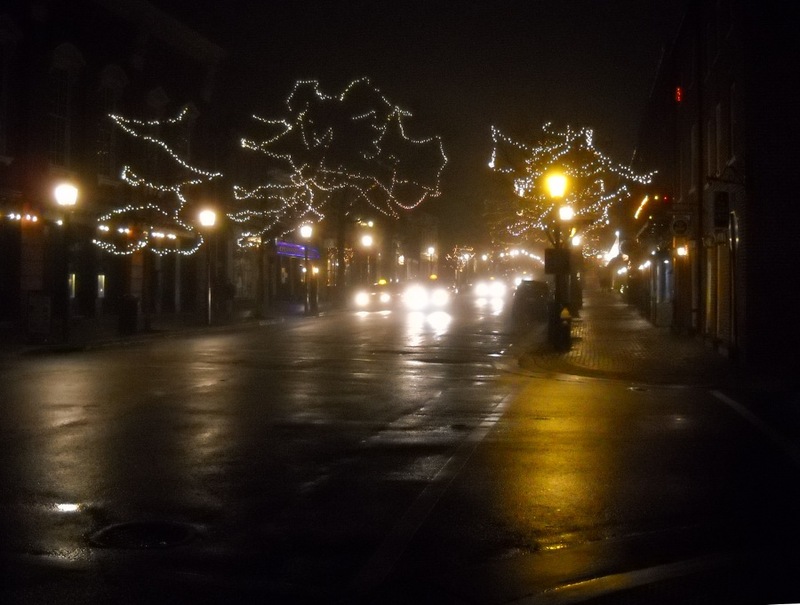 But the street is all I have, even if in winter it is an inefficient use of time, even if it is brutally hard. I have to do it, and I'm so grateful I have it. I just have to make it through this winter, no matter how hard it is, take it day by day, till Spring comes. The simple truth is that I have walked many hard roads, dealt with many unfortunate circumstances, and I don't complain, I just get it done. My discontent stems from the fact that this is not my choice, but a worst case scenario forced on me, for no good reaon, by my own family, from some tangled craziness ranging from ineptitude and irrationality to malice, with disregard, inconsideration, and disrespect figuring prominently no matter what, and I am supposed to just take it and pretend nothing is wrong, which is something I am done with after last Summer. I’ll get it done, but I am done with just accepting being abused. That is not a hard place to be content. And the cost is high, both in putting off my life for another winter, while I know what I can and want to do, and I sit and stare at all the things I put on the shelf, from everything I need to do to make progress with the music to just having everything I own packed in the van and sitting in the driveway for a year and a half now while I get by on two pairs of pants without holes in them, but I can’t do anything about it because I don't know if I am staying or going, and have to be ready to jump every day. I try to maintain a double vision, having two plans, feeling there is a positive future either way it works out, but inable to do anything, and unable to care about the future, when my normal life is one of commitment, long-term plans and preparations, of competence and responsibility, of consideration and respect. So, though I know I am still luckier than many in the world, and I am lucky to have the skill, knowledge, and ability to survive and get by, and am grateful for it, but that doesn't help the heart and spirit, though I am glad I can see the ridiculous aspect of it and laugh sometimes, at how over the top it all is, though there is a hard edge, hard and sharp. I should not be content with a situation that is wrong, there is nothing wrong with negative reactions to real wrongs, to injustice, as long as I act rationally and get everything I do done right. In the end, I just wait, knowing it will end eventually, one way or another. An old friend from my teens was in town from NYC, visiting their father, who is over 90 now. So I went over to visit, play their piano, play my guitar, sing some songs. They remind me it is only 48 days till Spring. But that is another story. Right now I need to stop writing and get to work outside, before it rains or snows, again. But I am getting it done, it is not the first hard road I have walked, by a long shot, and "this too shall pass". And as always, there are still days when the sun shines, moments when everything is "so fine". 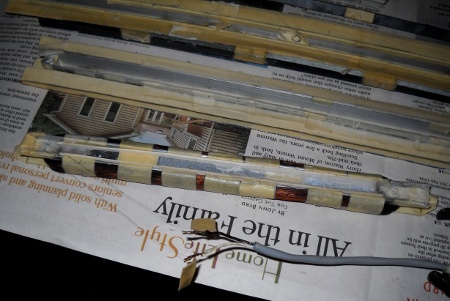 This entry was posted on Friday, February 8th, 2013 at 5:50 pm	and is filed under Studio Journal. You can follow any responses to this entry through the RSS 2.0 feed. Both comments and pings are currently closed.